Boston University’s College of Communication. Boston has been named the ninth best city out of 180 in the nation for finding a job in 2019, according to a WalletHub Report. Boston is teeming with young professionals, top-rated universities and big-name corporate businesses, as well as culture, art and history. To add to the list, a WalletHub report ranked Beantown as the ninth best city out of 180 in the nation for finding a job in 2019. WalletHub, a personalized finance website, released its “Best Cities for Jobs” findings, detailing the best locations to find work, on Jan. 3. WalletHub is owned by Evolution Finance, Inc. and serves customers through credit score reports and savings plans. James Feigenbaum, assistant professor of economics at Boston University, said job-seekers have enjoyed a low unemployment rate for decades, relative to 20th century trends. In January 2019, the unemployment rate was at 4 percent, according to a recent jobs report from the U.S. Bureau of Labor Statistics published Feb. 1. Feigenbaum said technology has helped make this job hunting easier. With platforms such as LinkedIn and Handshake, jobs are a click away, allowing for easier career change. In crafting the study, WalletHub analysts compared a mix of characteristics under the main categories of “Job Market” and “Socio-economics” of each given city, WalletHub communications director Jill Gonzalez said. “When we’re focusing on the best places for jobs, we want to first and foremost examine the job market,” Gonzalez said. The report assigned each city a score out of 100, with a maximum potential of 80 points for the job market category and 20 points for socio-economics. The top-ranked city, Scottsdale, Arizona, received a score of 66.58, and Boston received 61.70. Analysts accounted for job opportunities, monthly average starting salaries, access to employee benefits and disability-friendliness of employers to determine a score for the job market category, according to their website. Factors such as commute times, affordability of housing and family-friendliness comprised the socio-economics category. Factors were weighted based on their relative importance. A suitable living environment also played a role in calculations, as individuals often live close to where they work, Gonzalez said. The relationship between the cities motivated analysts to uncover how and why job-seekers find work, according to the WalletHub communications director. Gonzalez said this trend underscored people’s ability to be selective about the jobs they are looking for, and cities themselves have become more of an afterthought. “It’s certainly telling for the job market turnover rate,” she said. While the idea of an increasingly open job market may be genuine, WalletHub’s study does not stand without limitations, according to Feigenbaum. He said there is a deceiving nature of the general term “labor market” that the report uses. “The state of the labor market is not just summarized by one simple number like an unemployment rate, but really of labor markets that are a bit more separate — often defined by things like experience or education,” he said. Feigenbaum said the city is a hub of higher education and the tech boom, which he called an “idea factory” in the Northeast. Between its amenities, culture and history, he said, Boston is a popular place to call home. Feiya Suo, a Boston University junior in the College of Arts and Sciences, said she is excited yet intimidated by a Boston job hunt due to competition among applicants from Boston’s many academic institutions. Boston’s college students are motivated to seek jobs in this city, she said, given the environment. 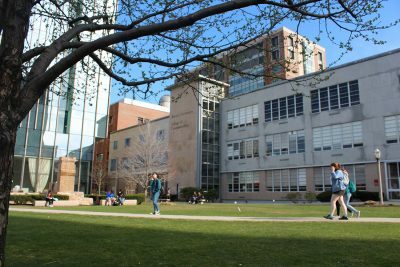 “I think a job in Boston would be pretty ideal for Boston’s college students after graduation because of the high quality of life we can have here,” Suo said. Gonzalez said this study is conducted every year and allows WalletHub, as well as Americans, to better understand employment trends from year-to-year — and maybe make career and living decisions based off of it. “Just because your dream job isn’t in the top three cities this year doesn’t mean that that can’t change soon,” she said.